The results of a DISC questionnaire are usually presented in the form of a DISC Graph (or a set of graphs, known as a Profile Series). 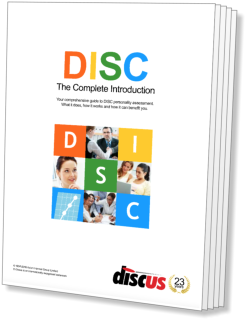 This chapter looks at the different types of DISC graphs available, the four DISC factors (Dominance, Influence, Steadiness and Compliance) and the twelve standard 'sub-traits' that are derived from these four factors. This section explains the relationship of the 'Biaxial Model' and the Style Card to the standard DISC Graph. You will find this particularly helpful if you have read through chapters I and II and are interested in the direct connections between the underlying theory and the DISC profile itself. In order to produce a set of DISC results, it is of course necessary to objectively assess an individual's behavioural style. The range of techniques available for achieving this are growing and diversifying, but there are certain principles that remain standard in any DISC questionnaire. This section examines these underlying ideas. Most DISC profiling systems provide three standard DISC profiles, each of which goes by various names. This section explains the meanings of these three profiles, and their relationships to one another. The first of the four DISC factors is Dominance, abbreviated to D. This section gives a description of the Dominance factor. Influence (abbreviated to I) is the second of the four factors. In this section, we discuss the main elements of the Influence factor. Steadiness (S) is the third factor. The traits and behaviour of the Steady style are explained in this section. The fourth and final DISC factor is Compliance, or simply C. The Compliance factor is described in this section. It is not unusual to find variations across the three graphs within a DISC profile series. In this section, we look at the significance of different shifts, and the ways that these can help interpretation. From combinations of the four basic DISC factors, it is possible to extract twelve further factors, called sub-traits. This section looks at these twelve sub-traits, their definitions, and their meanings. Job Matching is a useful technique for quickly assessing an individual's suitability for a particular role, achieved by matching a pre-defined Job Profile or Template with a DISC profile. This section looks briefly at the theory and practice of this technique. While DISC was not explicitly designed to measure stress, it is often possible to use a profile series to derive a general picture of an individual's stress levels, and their likely sources. This section takes a look at DISC's uses with regard to stress.